The latest news from the International and Foreign Language Education Office of the U.S. Department of Education. 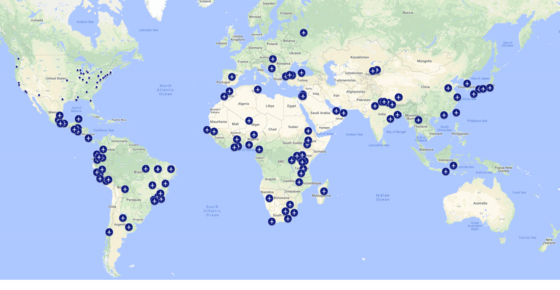 Explore our Google map of FY 2018 IFLE grantees to learn more about the doctoral students that are currently funded under the Fulbright-Hays Doctoral Dissertation Research Abroad Program. We're on YouTube with informative webinars and exciting grant program videos. Subscribe to IFLE's YouTube channel to enjoy the latest content! Have you received a Foreign Language and Area Studies (FLAS) fellowship or participated in a Fulbright-Hays grant program? Join our alumni groups on LinkedIn! We seek motivated students who are anxious to learn and work as part of our team as an unpaid full- or part-time intern during the summer, fall, and/or spring. Visit our website for more information. We want to hear from you! Do you have suggestions for webinar topics? Ideas for things to include in future newsletters? Send them to Carolyn Collins atcarolyn.collins@ed.gov.